Nestled into a valley in the northern most province of the Czech Republic is a blue house that sticks out, no matter what angle you look at it. This is the Blue Owl Bohemia in Loužnice, an English library and resource center. This warm and beautiful building is the creation of Mimi Rogers, a mother, teacher and Chicago Cubs fan. 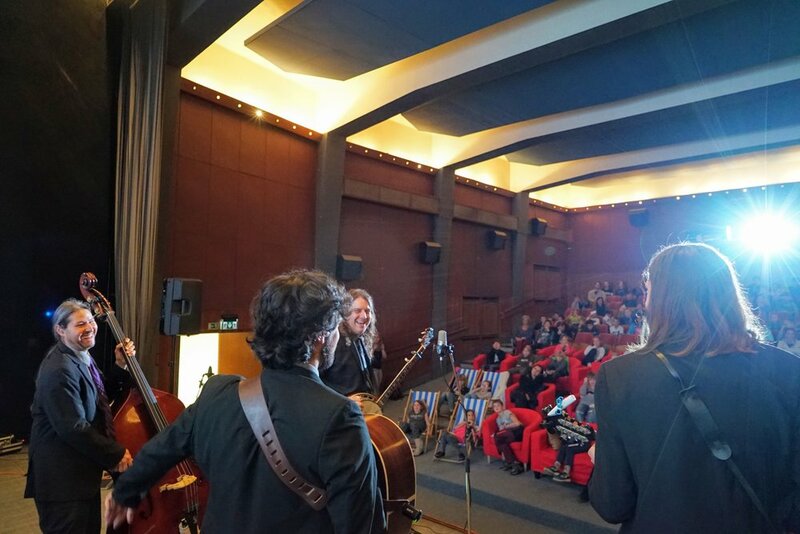 We met Mimi in 2017 at a show we played a couple towns over where we hatched a plan to build some Bluegrass Ambassadors programming here in Czech Republic. We were excited to build our first international program funded by a partnership with an NGO like Mimi’s, but we had absolutely no idea how powerful it was going to be. 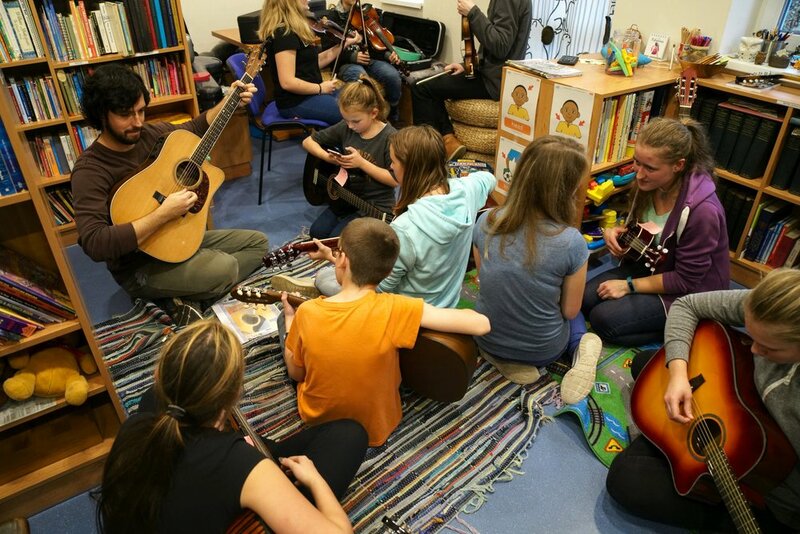 We are so excited to be able to share with you what it was like to work with these bright children and also get an intimate view of what it’s like being genuinely welcomed into a Czech town. Our first day of teaching happened just down the road in the slightly larger town of Železný Brod. 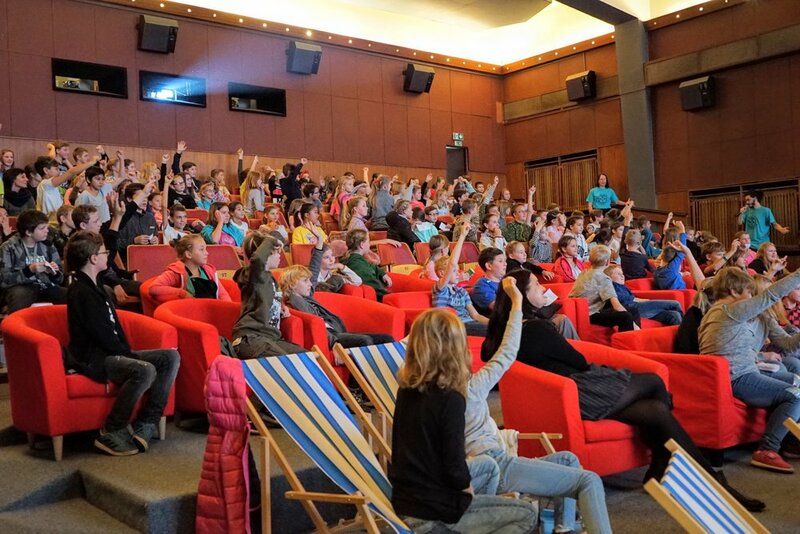 Mimi spent the last 6 months getting the word out to a bunch of teachers and kids from multiple schools showed up to the cinema in town for a two hour English workshop. Learning English here is extremely important for young Czech children as it gives them a huge leg up to be able to speak a “Lingua franca” or universal language. This was somewhat new territory for the Bluegrass Ambassadors, but we did a good amount of prep work and actually talked to an ESL teacher before the trip for some tips. It worked out incredibly well and we even had the kids dancing in the aisles to “Up and Down the Mountain”! In the afternoon we worked with a group of students from a technical High School in Železný Brod. We learned that the town has a long history of glass making, and while the main factory closed about 9 years ago, the schools still teach the glass arts alongside chemistry and other sciences. This workshop evolved more into a conversation about bluegrass and our lives as musicians among other things. The students all spoke quite good English and it all unfolded naturally. At the end of the program we were honored to be presented with some incredibly delicate and beautiful glass roosters as a gift (above). The following day we settled into the Blue Owl for a music program with about 30 kids from around the region that had signed up for a music workshop. Some of them showed up with their own instruments, but those that didn’t got to try out the instruments we bought with a generous donation from Reverb.com. Those instruments are staying at the Blue Owl forever and will continue to be a resource for the community. Huge thanks to Reverb for making that possible! 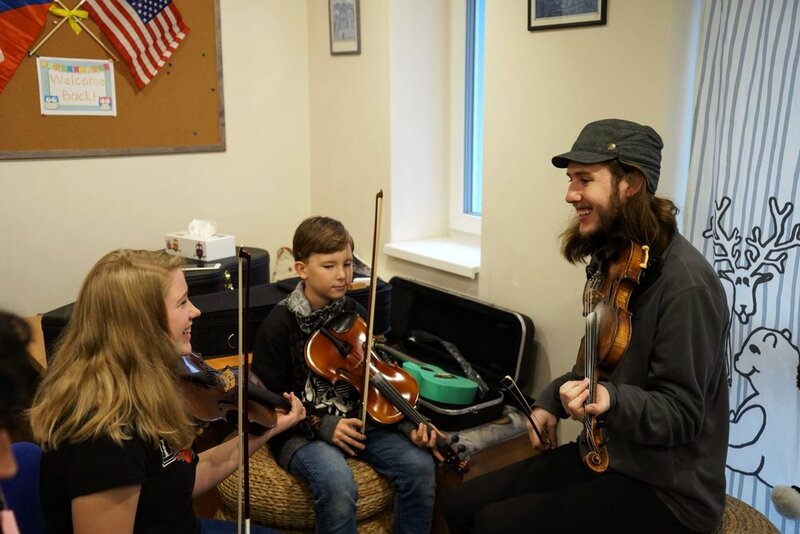 Below is a video from the workshop where we played the Czech song that we learned, Jožin z bažin, with the kids at the Blue Owl. We’ll finish this story with a moment that even a video might not do justice. The kids had asked us to play the “Star Spangled Banner” and we obliged them, naturally asking them to return the favor. A young man pulled his trumpet out and began to play the melody and then the whole room sang the Czech National Anthem for us. It’s hard to put into words how beautiful it felt. There was this palpable sense of connection in the room that only these kinds of moments can give you. It’s these very connections that inspired us to start Bluegrass Ambassadors in the first place. Stay tuned for part 2 where we take you into a Czech “Sokol” (a hard to translate type of community center in nearly every Czech town) for a night of ballroom dancing, bluegrass and…Chicago style hotdogs? For real, folks. It happened. 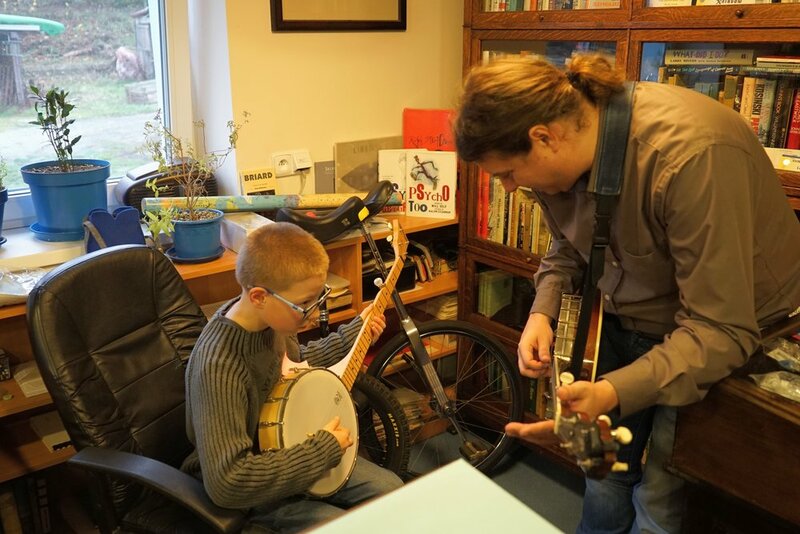 Reverb donates $2500 to Bluegrass Ambassadors to bring instruments to Czech Republic!